ASBA has announced its new mobile app, available via free download on iPhone and Android devices. 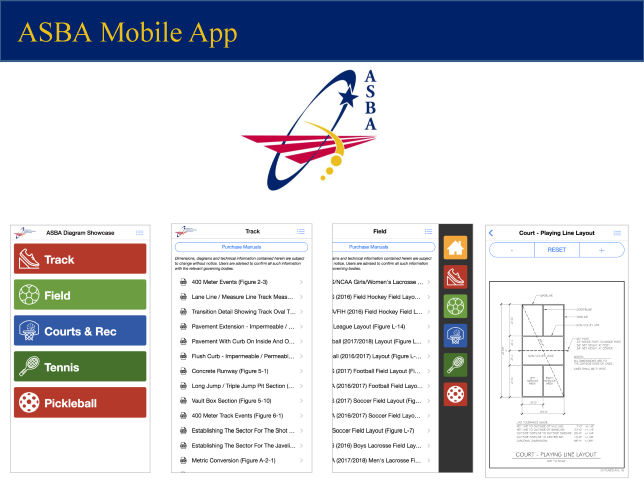 This entry was posted in December and tagged app for Android, app for iPhone, app store, ASBA ASBA Design Showcase, court and field diagrams, mobile app, mobile app for sports builders, Sports Facility Construction, sports facility design. Bookmark the permalink. Used it already today to get distances from pickleball lines to the fences. Took all of 20 seconds to access the drawing and get the answer I needed.